Clarity Colorimetry conducts colorimetry assessments in Norwich for both children and adults and we’re often asked what’s involved in the process. This is how. How does the colorimeter work? An examination with the colorimeter enables the effects of colour, saturation and brightness to be explored systematically and efficiently whilst the eyes are colour adapted. The shades available enable the tint to be precisely tailored to the individual’s needs. Any requirement for a refractive prescription (long or short sight etc) can be included in the final precision tint prescription. Precision tinted lenses are more convenient when writing, using computers and copying from the board. Overlays cannot be used for these activities. What do the colorimetry assessments involve? The Intuitive Colorimeter is used to identify the exact coloured tint that may be required for spectacles. The patient sits in a darkened room, and looks at text through the viewing window of the machine. Coloured filters are passed in front of a light source and the patient is asked to comment on the distortions they are experiencing with the text. There are over 7000 colour combinations and the colour requirements differ significantly between individuals. The optimal colour is chosen by a process of elimination in which colour, saturation and hue are independently adjusted for the patient’s comfort. Once the optimum colour has been identified, Precision Tinted Lenses can be prescribed. Coloured lenses are more practical and accurate in many more situations, in the classroom or work environment, such as for writing, working from the board or when using a computer. When will you need additional Colorimentry Assessments? The optimum colour (whether for overlays or precision tinted lenses) can change over time, especially in children. It is recommended that children with visual stress undergo a colorimetry test every year. The colour is less likely to change for adults and usually colorimetry is only repeated for adults if they feel that the benefit from their current colour is reducing. To book an appointment to discuss how Clarity Specialist Colorimetry can help you, click here. 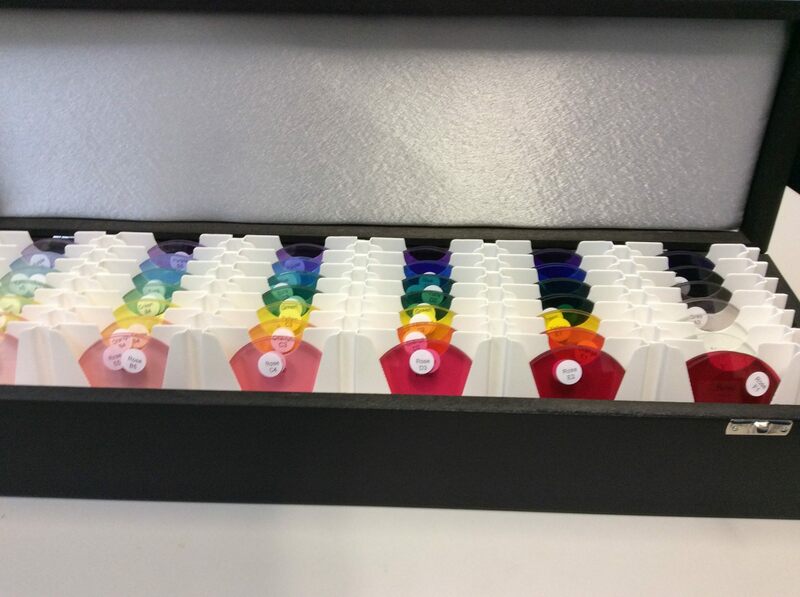 To find out more about colorimetry testing visit the International Institute of Colorimetry.